A lot of you guys probably heard of this exhibition before! It is in the news almost every year because of the impressive pictures, and this year the exhibition comes to Auckland! For more information about this amazing Exhibition, take a look here! Okay, now be completely honest. Who didn’t get even a little excited when you saw this?! DISNEY ON ICE. I don’t think it gets any better. This amazing show will be performing in Auckland from Friday the 24th of July until the 26th in the Vector Arena. For ticketing and the correct dates and times, take a look here! Yaaay it’s time to get creativeee!! This weekend the Scapbooking & Crafting Expo will be on! They have classes, seminars and workshops that you can book yourself into free demos, competitions, displays, ideas etc. So basically this will be a whole weekend full of creativity! Wanna get creative? Take a look here! The NZIFF is an annually returning festival in the winter. They bring all different kinds of movies from all over the world to Auckland to show to you! You can watch the movies on 6 different locations and is definitely worth a visit if you are a big fan of movies! Want to watch a nice movie? Take a look here for more information! Are there any ice skating lovers on here? Because now is your chance to enjoy some ice skating right in the city centre of Auckland. The Ice Rink is open from 10am in school holidays and 12pm on any other day until 10pm for 7 days a week! At night the lighting gives you a warm feeling as if you are in winter wonderland! Get Frozen, Let it go, and build a snowman! For more information look here! This entry was posted in Uncategorized and tagged activities, activity, aotea, auckland, cold, crafting, disney, disneyonice, filmfestival, frozen, handyman, icerank, intern, INTERNeX, interns, learn, letitgo, live, new zealand, newzealandinternationalfilmfestival, nziff, scrapbooking, snowman, winter, work, worklivelearn, worldpress on July 9, 2015 by INTERNeX New Zealand. The winter is slowly passing by and every body is still working hard for some travel time. If that sounds like you be lucky, cause you’re doing right! Most travel companies have good winter deals and if you wanna travel in a comfortable way with a lot of cool people think about the Stray Passes. They are on Sale now as well, so check it out. Find the right Pass at http://www.straytravel.com/ or come to the NTERNeX office for help. You save 40% with all Passes over $700. And if your stay is over soon and you have to travel now you can additionally grab the 2 for 1 Activity deal. 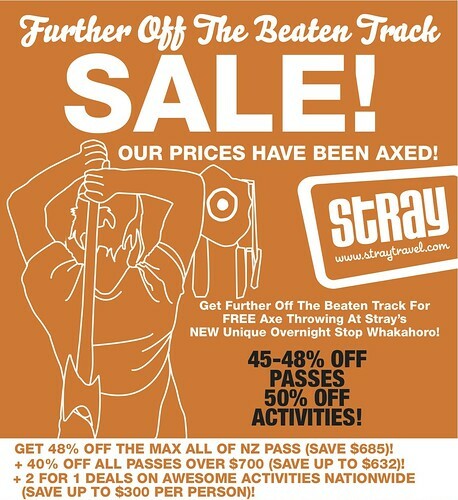 Just bear in mind that this amazing pass prices are just valid until August 15th, 2011 and the 2 for 1 deal until 31st August. If you have any questions contact me for more information. And we will help you to have an unforgettable stay in New Zealand! This entry was posted in INTERNeX, new zealand and tagged activity, bus, discount, INTERNeX, new zealand, offer, pass, stray, travelling, Working on July 29, 2011 by ixcaroline. Are you annoyed of the rain? You don’t have to because there is lots of stuff to do in Auckland at rainy days. Just look at the following tips, I am sure something will meet your interest. This event is a special offer for the winter time. It starts with a performance of the Prestige Dance Crew – a highly respected New Zealand urban dance group and offers a workshop afterwards. So if you’re like dancing you should have a look at the Auckland Townhall. This building on its own is a worthwhile visiting. And its definitely fun to learn some characteristic dancemoves with your friends. For the Art interested people this is a definetly must-do. This Theatre festival is the largest 10 minute theatre festival in the world.You can enjoy one of the best 40 plays and theatreworks from local and international writers. Ever dreamt of seeing real dinosaurs? You can experience this at the worldwide unique show Walking with Dinosaurs, which is shown in New Zealand after a 4-year world tournee. It is one of the most exciting and groundbreaking shows ever seen in New Zealand that brings the dinosaurs back to life for you. You need to be active at the weekend, but don’t wanna go to far? What about climbing and swimming? You can challenge yourself at New Zealands largest Indoor Climbing wall. You don’t need any special gear or experinece. You can rent the gear on-site very cheap. And also the Lessons aren’t that expensive. Just get some friends together and spend an adventurous day in the Climbing Hall. Not to much action but still a little bit sport. You can check out the Olympic Pools and Fitness Centre in Newmarket. They have really good facilities for finess and swimming. And after a little workout you can relax in the Spa, the Sauna or the Steam Room. So get your friends together and plan your weekend! Enjoy it! This entry was posted in INTERNeX, new zealand and tagged activity, art, auckland, climbing, dinosaurs, events, INTERNeX, prestige dance crew, rainy, short&sweet, swimming, tips, weekend on July 8, 2011 by ixcaroline. The very last chance for an amazing Surf-weekend with Mojo this season! This weekend the Mojo surf-season will come to an end so it’s most likely your last chance to learn or improve your surfing for quite a while. Over the past few weeks 10 INTERNeX people have taken the trip and we have had a lot of positive feedback about this amazing weekend. At the Easter weekend trip one girl had such a good time that she has booked to go again this weekend. Not only that because it’s the last weekend, we have a very special price of $299 which includes, transportation to and from Raglan with an awesome guide, all meals except the first nights dinner, up to 3 surf lessons over the weekend with an experienced surf teacher for about 2 hours each time, accommodation in a lodge at Raglan sharing with your surf group and a lot of fun whether it’s raining or sunshine. So, for all of you who thought about booking the trip, now it’s the best possibility to do it, a great price and we have just been told the conditions look good this weekend for learning to surf. So if you want to go or want to go again, don’t hesitate, just book via mail at pr@internexnewzealand.com or contact us if you need more information. What a good idea to spend a weekend out of town. Try something new and explore the Kiwi Surfstyle. This entry was posted in INTERNeX, new zealand, Uncategorized and tagged activity, fun, INTERNeX, mojo, raglan, surfing, surflesson, surfseason, weekend on April 28, 2011 by ixcaroline.